Bengal Cats For Sale - What Questions To Ask Breeders? 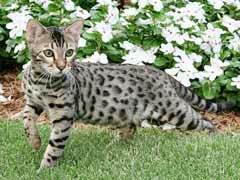 Bengal Cats For Sale – What Questions To Ask Breeders? 1. What type of domestic cat are the breeder’s Bengals crossed with? Bengals bred with a traditional tabby cat will have a marbled coat. While this is desirable to some, remember that the purpose of creating the Bengal breed was to replicate the leopard pattern, so if you want a Bengal with leopard rosettes, be sure your breeder steers clear of the tabby cat. 2. What is the Bengal cat personality like? Bengals are known for being very active and playful, and also to take their fair share of catnaps. But your breeder should know more, specifically, about their breed’s temperament. 3. What kind of upkeep do Bengals require? Anyone offering Bengal cats for sale will be able to tell you about vet visits, diet, and exercise. 4. Are the breeder’s cats recognized for championship competition? There are many Bengal cat breeders that specialize in producing only fourth and fifth-generation cats, which are championship competition-quality. If this is important to you, then you need to find out which breeders are. If you are looking for an exotically beautiful and rare feline with the personality of a domesticated house cat, then you should look into Bengal cats for sale. If you know the right questions to ask a breeder, you will be prepared to make an informed choice about becoming the proud owner of a truly unique pet.